^ a b BirdLife International. 2015. 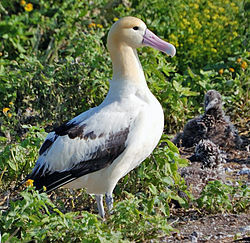 Phoebastria albatrus. The IUCN Red List of Threatened Species 2015: e.T22698335A84645695. doi:10.2305/IUCN.UK.2015.RLTS.T22698335A84645695.en. Downloaded on 08 May 2016.